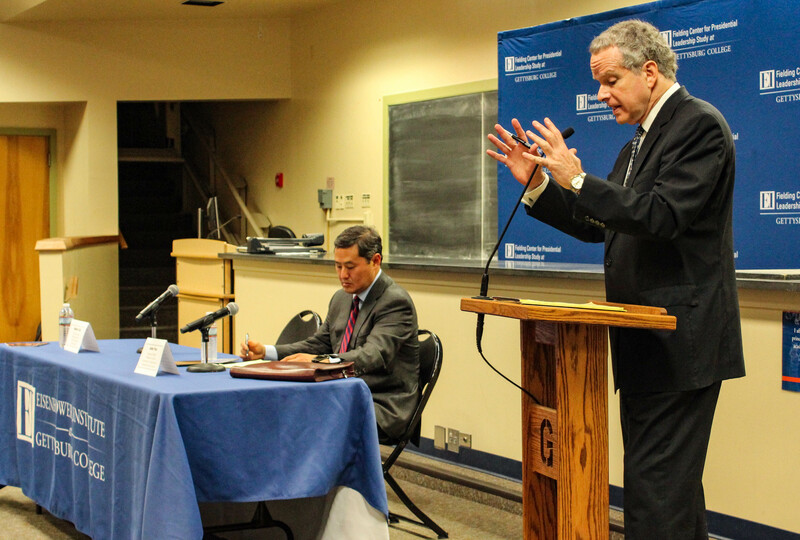 Yoo, Coll Debate Extent of President’s War Power at Fielding Center Event | The Gettysburgian. On Thursday, Sept. 20, the Fielding Center for Presidential Leadership Study, part of the Eisenhower Institute, held a public debate on the president’s power of war, particularly in regards to the question: Can the president launch war without congressional authorization? 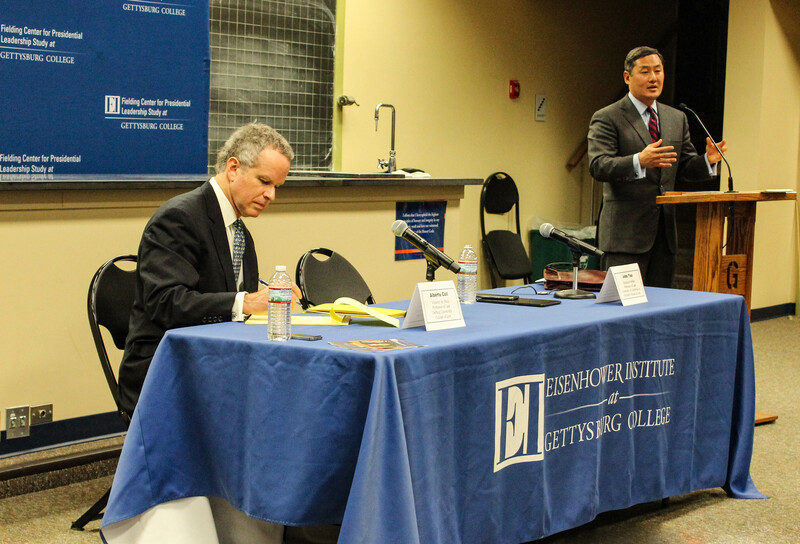 Nearly 100 students anticipating a spirited discussion filled Mara Auditorium to hear Professors John Yoo, Emanuel Heller Professor of Law at the University of California-Berkeley and Alberto Coll, Vincent de Paul Professor of Law at Depaul University. Each took twenty minutes to defend their sides, with time for two five-minute rebuttals at the end of the debate. After the opponents finished their arguments, two Fielding Fellows — Jacqueline Kotkiewicz ’19 and Celia DiSalvo ’19 — conducted a question & answer session with the debaters to find out more about their views. John Yoo, who served in the George W. Bush administration as Deputy Assistant Attorney General in the Office of Legal Counsel, which is responsible for determining the constitutionality of proposed presidential actions, took the side of supporting the president’s ability to declare war despite a lack of congressional authorization. Yoo reasoned that the majority of past wars came from the presidential initiative, listing George H.W. Bush with Panama, Ronald Reagan with Libya, Bill Clinton with Kosovo, George W. Bush with Afghanistan, Barack Obama with Libya, and lastly, Donald Trump with Syria. He argued that the congressional statutes came after the war was initiated. In Yoo’s eyes, the Constitution gives the president initiative to act first, but Congress has the ability to restrict the president by not appropriating funds or through impeachment. Yoo argued that Congress takes a lazy approach, pushing the job of war off to the president because the main goal of congressmen is to be re-elected. Yoo pointed out that though Lincoln is regarded as one of the greatest presidents in American history, he said that he had the unilateral power — and responsibility — to stop secession from happening. He called up the army and navy, ordered the Southern blockade, and took money out of the treasury in April of 1861, albeit Congress was asked to bless Lincoln’s actions only in July of that year. Yoo also added that declarations of war in the past were usually issued after the war started, giving the example of the Declaration of Independence. On the topic of constitutional law, Yoo said that Article 1 Section 10 reads that “states may not engage in war without the consent of Congress.” The Constitution does not say that states may not declare war. Congress has the power of the purse, meaning that war cannot happen without congressional funding. Yoo ended his argument by defending the system of checks and balances, specifically about Trump and Syria. He contended that disliking a president or government employee does not mean that the Constitution’s set of rules and systems should be invalidated. Misreading the Constitution harms both the people and the country. Following the conclusion of Yoo’s argument, Professor Alberto Coll took the podium. A former Dean of the Naval Warfare Studies and Research Fellow at the Naval War College, Coll also served as Principal Deputy Assistant Secretary of Defense during the George H.W. Bush administration from 1990 to 1993. Coll began his argument in support of needing congressional approval for the president to declare war by referring to the much-hallowed speech by Lincoln, The Gettysburg Address. The quote, “Of the people, for the people, by the people” validates the fact that the people retain the power, in this democracy, to make our own choices for their own country, Coll argued. Coll framed the remainder of his argument around three questions: What does the Constitutional text say? Does the Constitution intend for the president to put us at war without authorization? What is the standpoint of representative government in terms of morality? His questions began to be answered as he talked about the Declaration Clause, which served its purpose as a “declarational” clause. He talked about the severity of war, predominantly how it takes America from a state of peace to a state of war. Coll acknowledged that the president holds the power to defend the country, yet does not have the power to declare if we are attacked. Coll countered the argument Yoo made about Lincoln, citing that Lincoln did not ask for congressional approval because Congress was secessional and wanted to ruin the country. Their opinions would have been meaningless. Coll said with finality that the president has no power to declare war. The president is bound to resist force by force, as well as obligated to respond to attack, Coll insisted. The president commands the forces, but cannot put the country into war. Therefore, the legislature alone has the power to declare war, or interrupt the blessings of war. Congress is constitutionally invested in approval and ensuring that the president does not overstep his legal bounds. After brief rebuttals, the pair fielded questions gathered from the audience on whether the impeachment power is a legitimate check on the president’s power in foreign policy, to what extent Congress has abdicated its responsibility in foreign policy, and whether the War Powers Resolution is constitutional and/or a good idea. In their closing statements, the pair quipped that they would return in two years to debate whether the president can pardon himself.